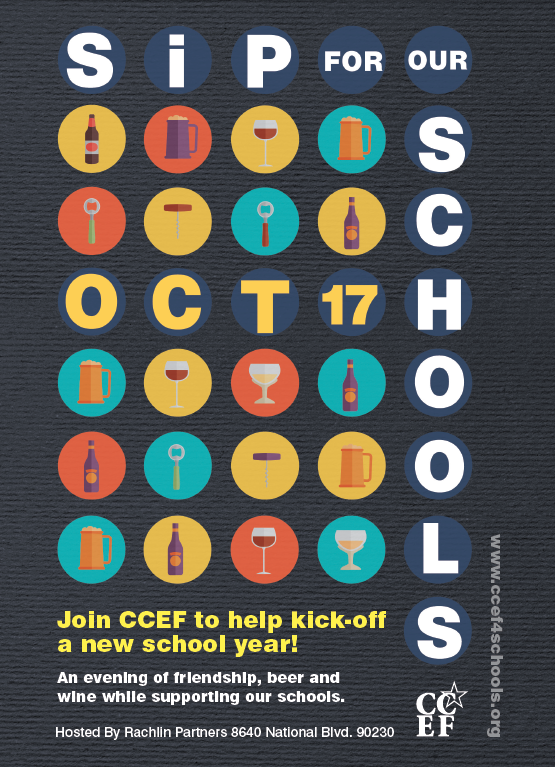 Posted on October 6, 2015 By Communication Arts + Design, Inc.
Join the Culver City Education Foundation (CCEF) 7th Annual Sip for Our Schools fundraiser event Saturday, October 17th from 7 p.m. to 10 p.m. The proceeds from the event support and enhance quality education for students in the Culver City Unified School District. Sample fine wines, craft beers and light bites from Sorrento Italian Market, B&G Bar and Garden along with City Tavern. Enjoy the mellow harmonies of CCHS Jazz Combo on the outdoor veranda at Rachlin Partners. Advance tickets may be purchased for $50 per person. Tickets will also be sold at the door for $60 per person. Valet parking is available.